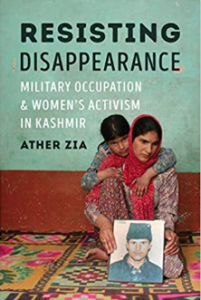 “The activist women who form the Association of the Parents of the Disappeared Persons (APDP) keep public attention focused on the 8,000 to 10,000 Kashmiri men disappeared by the Indian government forces since 1989. Surrounded by Indian troops, international photojournalists, & curious onlookers, the APDP activists cry, lament, & sing while holding photos & files documenting the lives of their disappeared loved ones. In this radical departure from traditionally private rituals of mourning, they create a spectacle of mourning that combats the government’s threatening silence about the fates of their sons, husbands, ” fathers.